The problem is expressed in different ways in a seven-layer model to maximize mutual understanding and communication about the problem (figure 1). 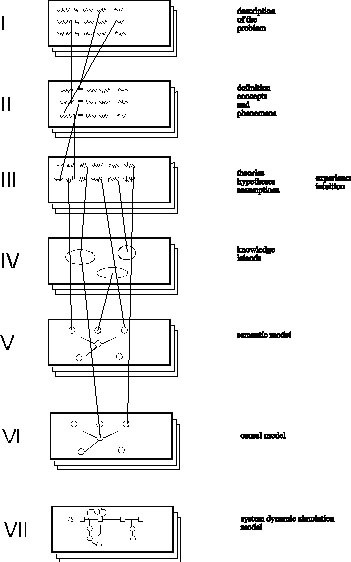 The seven-layer model is the central communication tool of the Compram methodology. Using the seven-layer model the problem can be expressed in different ways, using different models, and different languages. In this way experts and actors from different backgrounds can understand each other and recognize their own favorite way of expressing the problem. Expressing the problem in different ways and in different languages also makes it easier to see what is missing. It helps to adjust the models and to make clear how the phenomena are related. Verbalism is using words without knowing what they mean.